TURBIDITY – an expression of the optical properties of a liquid that causes light rays to be scattered and absorbed rather than transmitted in straight lines through a sample. 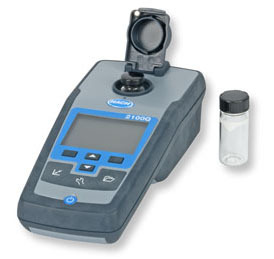 Although turbidity is not an inherent property of water, as is temperature or pH, the recognition of turbidity as an indicator of the environmental health of water bodies has increased, resulting in a growing demand for high-quality and objective turbidity measurements. To meet this demand, relatively inexpensive, yet sophisticated instruments have been developed. Geotech offers a wide variety of portable turbidity meters and can help you select the most appropriate instrument for your project objectives. 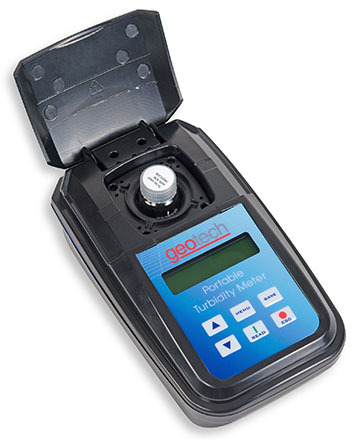 Geotech’s Portable Turbidity Meter is designed to withstand the rigor of field analysis with laboratory precision and repeatability. The large membrane keypad makes operating the instrument simple when wearing gloves. The bright display can be viewed in varying light conditions. 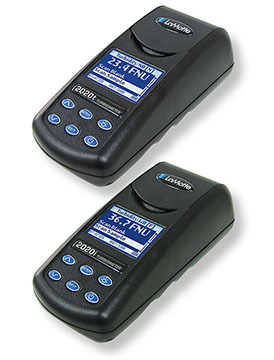 The 2020t and 2020i turbidity meters are two of the most innovative, waterproof, handheld meters available. These instruments feature a multi-detector optical configuration that assures long-term stability and a radiometric mode for pinpoint range detection – ideally suited for low-level drinking water applications, mid-range industrial, and high-range environmental applications. Designed to provide the ease of portability needed in the field with rugged durability. 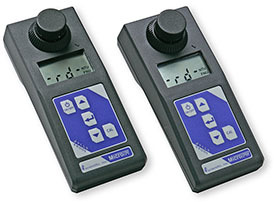 The MicroTPI and MicroTPW are a “must have” for anyone monitoring turbidity on the go. The shock-resistant carrying case holds everything needed for field operation while the instrument itself removes easily to go wherever you need it. With resolution of 0.01 NTU and an extended range to 1,100 NTU, the MicroTPI & TPW Handheld Turbidimeters are perfect for field use. Hach Portable Turbidimeters offer a combination of advanced features, such as assisted calibration, simplified data transfer, and measurement innovation, for the most accurate results every time. 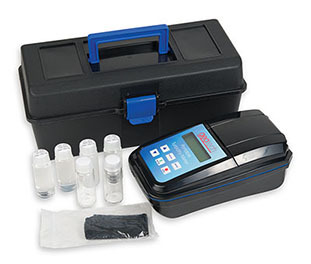 The Orion AQ4500 Turbidimeter offers advanced features not available on any other benchtop or portable turbidimeter. The AQ4500 offers a dual source LED which allows readings that comply with both EPA 180.1 and ISO 7027. This portable field unit is truly IP67 waterproof with typical battery life over 1000 hours on one set of batteries and datalog capacity of 100 points which can later be downloaded to a printer or computer. The AQ4500 accepts 24 mm cuvettes and comes with a two year warranty.